John Velazquez with the Atto Mile trophy. 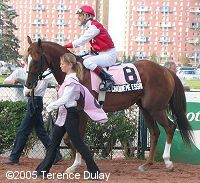 The ninth edition of the Grade 1 Atto Mile was contested on Sunday afternoon at Woodbine Racetrack, with current Breeders' Cup Mile divisional points leader Leroidesanimaux the overwhelming 3-5 favorite in the field of nine older horses. 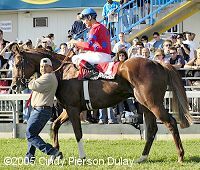 "Leroy", as he is called in the stable, came into the race with a seven-race winning streak including a course record breaking effort in the Grade 2 Fourstardave Handicap at Saratoga last out. Among his challengers in this $1 million event were 5-1 second choice King of Happiness, shipping in from California for Neil Drysdale off of 2 straight second place finishes, and 7-1 third choice Royal Regalia, who holds the 1 mile course record at Woodbine set last year. When the gate opened, jockey Jono Jones sent the grey Royal Regalia right to the front but Leroidesanimaux and jockey John Velazquez were keeping pace with him along the rail, getting the initial quarter in a relatively quick 23.07 given the yielding condition of the course. Entering the turn after a half in 45.89, Leroidesanimaux pulled a length ahead of Royal Regalia with Velazquez still sitting quietly in the saddle. At the top of the stretch, Velazquez let out the reins and Leroidesanimaux began to pull away from the field. After six furlongs in 1:10.26, he was 2 lengths clear of 18-1 shot Le Cinquieme Essai with plenty left in the tank. 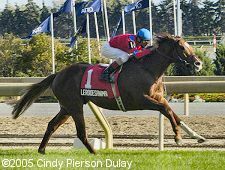 Through the long Woodbine stretch, Leroidesanimaux continued to open up and finished 7 3/4 lengths clear of the late-running 26-1 longshot Mobil, completing the mile on yielding turf in 1:35.08. It was just a length back to Le Cinquieme Essai in third, and another length to Vanderlin in fourth. .
On to the Atto Mile undercard results and photos including the Canadian Handicap and the Summer Stakes. Leroidesanimeaux parades for the fans. 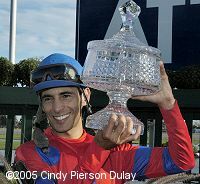 Winning jockey John Velazquez said, "I wanted to make sure he broke well and got a good position. Once I got in a good position, I knew he was comfortable, and after that I just kind of sat against him. Coming to the quarter-pole, I just kind of shook him up and he responded right away. I shook the whip at him and I hit him one time and he kept opening up on the field. He did it pretty easily. I was hoping that he would like this kind of going, and he obviously handled it perfect." Leroidesanimeaux heads for the winner's circle. 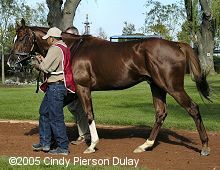 Winning trainer Bobby Frankel said, "To win eight races in a row, you have to be a horse that doesn’t make mistakes, and he doesn’t make any. This is the easiest I’ve ever seen him work because usually he doesn’t try to draw away like that. He likes to hang around the other horses. But he was just too strong today." 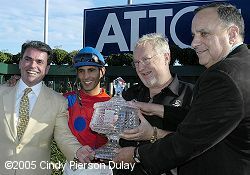 The trophy presentation with owner Goncalo Torrealba, jockey John Velazquez, race sponsor John Atto, and trainer Bobby Frankel. Frankel said, "He has got to rank up there with the better turf horses I have ever trained, he never gets beat. We broke real good, and John let him run out there a little bit, made the lead, now I am wondering if he was going to like the (soft) ground, then I am seeing him open up 3/4 of a length, a length, when I looked up at the television he was drawn out a little bit. It's eligible (to be soft) at Belmont in the fall. At least that's one good thing we got out of the way that we know he can handle soft ground." 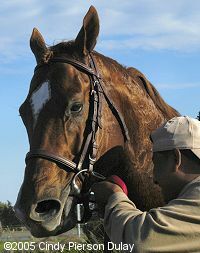 "Leroy" in the walking ring before the race. Asked if he would go on to the Breeders' Cup Mile, Frankel said, "I am sure the owner wants to supplement, and if he's doing really well, we will probably go. I had this race in mind (for a final prep) or the Shadwell Mile, and I chose this race. It gives us plenty of time before we are going to go to the Breeders Cup, and he runs well fresh, and we obviously did the right thing." Second place finisher Mobil in the post parade. 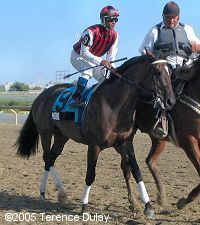 His jockey Patrick Husbands said, "He ran a good race. He's a great horse to ride. Mobil is a class horse. The winner showed he was the boss on paper, but my horse gave a great effort as he always does." 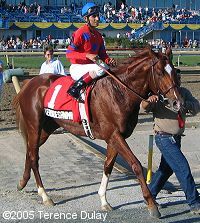 His trainer Mike Keogh said, "He just got tired from chasing that horse (Leroidesanimaux). That's a very nice horse. But I'm ecstatic. As always, (Mobil) shows up and gives it all he has every time." Third place finisher Le Cinquieme Essai heads out for the post parade. His jockey Steve Bahen said, "They weren't running that fast and he wasn't towing me like he was last time. But when I asked him, he came running. He tried his eyeballs out. He's a millionaire now, so that's the main thing. He's a nice horse, very honest. He tries every time." "Leroy" heads back to the barn.